People trust people, not companies. In fact, people trust their friends a whole lot more than they’ll ever trust advertisements. As business owners, we can overcome this trust barrier with user generated content. The beauty of user generated content is that it’s not only produced by a 3rd party (the customer, fan, or influencer) which saves us time, but also that this individual acts as an ambassador for our product or service offering. In this article, I’ll not only be touching on the importance of user generated content, but also how you can go about starting your first UGC campaign. Obviously GoPro is a giant company with a massive following, but the principles remain the same. People don’t pay much attention to advertisements. For the most part, they don’t trust the companies behind the ads unless they have purchased from the company previously, or heard good things from their friends. This is why word-of-mouth marketing is so important. Has your friend ever written a review on a company’s website or tagged a clothing brand in their Instagram? That’s user generated content in action. The customer, fan, or influencer creates the content, and then the company promotes it to their following. It’s as simple as that. What’s the effect of implementing user generated content campaigns? As mentioned before, when friends (or even strangers) speak positively about a brand, we take notice. In this regard, the company is able to build a growing presence of trust and reliability that leads us to believe their value proposition. We take notice not from ads, but from positive reactions from other people. If they have taken the time to share something positive about Company X, that means Company X’s product must be pretty darn good. In leveraging the word of mouth factor, we can spread brand awareness by cultivating an environment that promotes the sharing of our message via channels that our customers use. This is why we should focus on value creation rather than over-promotional content. If we can provide the upfront value for people and pull through on our promise, we have the opportunity to create an environment that encourages people to spread the word for us. Not only does this save money, it’s more effective. Okay, you offer products to people, but how can you get them to share those products with their friends so you can promote the content they have generated? There are several ways, and it also depends on the product that you offer. Some are going to be easier than others. For products that are visually appealing like clothes, food, technology, etc. you can leverage social channels that thrive off of visuals, such as Instagram, Pinterest, and Facebook. For example, you could run a giveaway that encourages people to share photos with your product(s) in them, or perhaps just send out free product to some of your most loyal customers. You’re providing the upfront value in these cases and hoping that customers and fans will return the favor. Most products that perform well on Instagram, Pinterest, and Facebook have a lifestyle element involved. We are catering to certain demographics, interests, and ultimately the way people express themselves. Does anyone really need a pair of $200 shoes? No, but if the customer likes them, they’ll most definitely want to show them off. Give them the opportunity to do so. In the situation that your products aren’t visually stimulating, it’s time to get creative. Put your product on the back-burner for a second and think about what appeals to your target audience. For example, if you sell kitchenware, have your followers submit their favorite recipes and use your products to make the food creations in a video. If you manufacture carpentry tools, create how-to content on building furniture and encourage your fans to submit their ideas for a chance to win your creations. Think about the content that your target audience would naturally want to share. Or, what content do they already share that your product could be intertwined with? Maybe you offer social media management or own a maid service. How can you take advantage of user generated content? This is where testimonials and reviews come into play. If you have a past customer who’s revenue doubled from your marketing expertise, have them share it with you so you can promote it on your website or social channels. 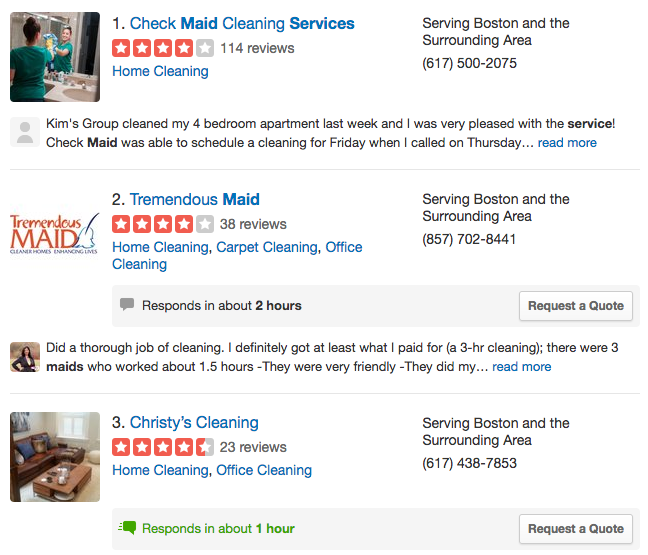 Or if someone was pleased with your home-cleaning services, have them give you a review on Yelp. When you promote your company in the future, you can reference the reviews and testimonials to back up your service offering. In essence, you are able to provide credibility through your customers. Prospective customers will trust them more than they trust you. Now you have to develop an effective strategy to implement within the marketing mix. Along with your own in-house content creation, this process will take some time. If you offer products to consumers, you will be promoting the campaign itself and encouraging fans to participate. And if you have a service, you’ll have to put in the work first before your customers can give you a testimonial or review. Think of it as an investment, with dividends paying in the form of user generated content. Yes, there’s work involved. But in a world that holds personal referrals high, it’s necessary to include customers as part of the marketing conversation. Advertising is usually a one-way street. With UGC, you have the ability to have customers talk back to you. Then you can promote their content, which they will love. I mean, who doesn’t want to be featured on a giant brand account? Many small business owners are afraid to run user generated content campaigns because they have a small following. Yes, it will be more difficult to get traction and encourage people to participate. Nonetheless, this shouldn’t stop you from trying small scale campaigns that will likely be inexpensive. Develop a better understanding of your target audience so that you can find ways to get in front of them. You could try leveraging the fans of competitor accounts or working with companies that offer similar products or services. For example, if you sell fishing products, team up with an outdoor apparel company to launch a viral giveaway. If you’re an artist, ask your fans what they’d like to see next or what other artists they follow. Furthermore, you could think of yourself as a user or customer for another company. If you love the products that this other company makes, create content that includes both their products and yours. Then, submit your photos/videos so that they can share it to their following. Don’t be afraid to ask! Get creative and brainstorm ideas regarding what would encourage people to take action. Build your following, engage with them, offer value, and then ask for it back in the form of user generated content.